Announcement has just been received of the death of Thomas P. Egan, aged 74 years, president of the world-wide known concern, J. A. Fay & Egan Co., Cincinnati, Ohio, manufacturers of the “Lightning” Line woodworking machinery. Thomas Patrick Egan was a resident of Cincinnati nearly all his business life. He was born November 20, 1847, in Ireland, and when an infant was taken by his parents to Hamilton, Ontario. As a boy, after leaving school, he was in the employ of dry goods houses in Hamilton, and then in Detroit, but when 16 years old his mechanical bent led him to Cincinnati, where he secured a position in a machine shop. After a few months, he changed to the firm of Steptoe, McFarlan & Co., which at that time was one of the heaviest manufacturers of woodworking machinery in the United States. He remained with them 12 years. Early in his employment with this firm he had the misfortune to lose an arm. Up to that time he had been engaged in the manual processes of the shop, but the accident sent him into the office, where he studied bookkeeping and the technique of the business, which started him on his career of inventor, manager and employer. In 1874 he decided to begin business on his own account, and with two partners opened a little shop, where at first the partners constituted the entire force. Seven years afterward, however, in 1881, the Egan Co. was incorporated with a capital of $150,000, with Thomas P. Egan as its president. This enterprise was successful from the first. It was located across the street from the establishment of J. A. Fay & Co., then the most important woodworking machinery establishment in the country, and of which it became a rival. The commercial battle was a warm one, and finally resulted in the consolidation of the two companies in 1903, under the style of the J. A. Fay & Egan Co., of which also Mr. Egan was president. Thomas P., Egan, manufacturer, was born in Ireland in 1847. When quite young his parents emigrated to the United States, and settled in Hamilton, Ontario. The son was graduated at the high school there, and having a decided inclination for mechanics, determined to enter that field, and removed to Cincinnati, O. He was twelve years in the employ of the machinery firm of Steptoe, McFarlan & Co., where he learned the practical part of the machinery business at the bench. His talents were quickly recognized, and he was taken into the office of the firm, and afterwards traveled for them on the road. In 1874 he started in the business for himself, and with two partners began manufacturing woodworking machinery on a small scale. Through the great improvements both in design and mechanical advantages made by Mr. Egan. the business grew to such an extent that in 1881 the firm was incorporated as The Egan Co., of which he was elected president and general manager. In 1803 his business joined forces with the old firm of J. A. Fay & Co., which was the most extensive in the same line in the United States. It was incorporated under the name of J. A. Fay & Egan Co., with Thomas P. Egan as president and manager, and has become the largest individual firm in the world for making woodworking machinery. The company has won the highest honors wherever its machines have been exhibited, from the Crystal Palace in London in 1851 to the Paris exposition in 1000, where it was awarded the "Grand Prix." In consideration of his exhibit there Mr. Egan was created a chevalier of the Legion of Honor in 1901. As a mechanical expert, he is perfectly conversant with every detail of his business. He also has a thorough knowledge of trade and commerce, both at home and abroad, and a number of his articles written upon current business conditions have had a wide circulation. He was the organizer and the first president of the National Association of Manufacturers of the United States, which was formed at a convention of several hundred representative manufacturers at Cincinnati, Jan. 22, 1895. He is also a member of the American Society of Mechanical Engineers, the Commercial Club, and the Manufacturers Club of Cincinnati, the Queen City Club, Country Club, and the Optimist Club. 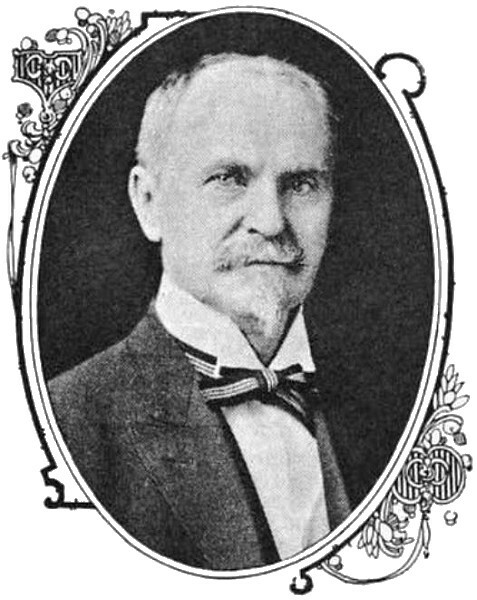 Thomas P. Egan is a Republican in politics, and at the 1000 election was a presidential elector, and cast the vote of Cincinnati for McKinley and Roosevelt. Thomas P. Egan. Some men may rise by the force that is in them, and several of this class are residents of Cincinnati, one of the most prominent being Thomas P. Egan, president of the J. A. Fay & Egan Company, manufacturers of woodworking machinery. Mr. Egan was born in Ireland—just where he does not recollect, as his father and mother crossed the Atlantic when the now millionaire was a mere infant of nine months. The father, who was a farmer of limited means, located near Hamilton, Canada, where he died at the age of eighty-four years. Thomas P. Egan was born November 20, 1847, and was precocious and energetic from the first. He received a common-school education at the Canadian schools, and at the age of fourteen graduated from the Central Public High School of Hamilton, Canada. On the evening of the graduating exercises he was employed by D. Smith, a dry-goods merchant, still living in Hamilton, to work at two dollars per week. This position the youth kept for two years, and then he turned his eyes toward the United States. The "Stars and Stripes," with the universal freedom and liberty it guaranteed, inspired the youthful employee, and he determined to try his fortunes in the South. He had a sister living in Cincinnati, and here was his objective point; and, having a few dollars saved up, with a stout heart he bid good-bye to home and friends and took the train for Detroit. There he tried to find work, but failing hurried on to Cincinnati that he might arrive before his limited purse was exhausted. He came and found his sister, and in casting about discovered that it would not take him long to get work. Had he remained at the little dry-goods store he would at the end of ten years, have received the highest wages paid, which was seven dollars per week; before ten years had passed he was receiving in Cincinnati a salary of thirty-five dollars per week. Thus it will be seen that two dollars per week was not wages enough for a youth of sixteen, and he determined when he secured a new position that he would get more money. He did; for William Kirkup, the brass worker and manufacturer, took the ambitious boy in. and paid him at the rate of three dollars per week. His duties were chiefly confined to running a lathe; but tiring of this monotonous work at the end of three months, he looked around for another position. He had received no increase in wages, and he thought he should take a step forward. The desire was then to get $3.50 per week and to go to work on iron. One evening, dressed in his working clothes, he made the rounds of the various machine shops in the city, and at last walked into the office of Steptoe, McFarland and Company, one of the earliest manufacturers of wood-working machinery in the United States, and at that time contemporaries of the J. A. Fay & Company, which was beginning to rise in the mercantile world. "What do you want a week?" asked John Steptoe. "I am receiving three dollars per week now, and I want fifty cents more." That was about all the conversation held, and in a few moments the sturdy boy was told to come prepared to take a position the next week. He did come, and remained with the firm twelve years, or till his twenty-eighth year. Mr. Egan had been working but two weeks when an accident happened to impair his physical powers to a certain extent, though it did not cause him to stop work. The loss was that of the left arm. While many people deliberately take advantage of such an accident to lie down and mourn, Mr. Egan did not pause, though the loss of the arm rendered it impossible for him to do hard manual labor as heretofore. The firm gave him an office position, and here came in the high-school training. He had studied bookkeeping for a while, and now that he could not labor he determined to fit himself for his new life. To this end, he entered the commercial college kept by a Mr. Gundry. The school was at night, and during the day the books of the firm were kept. This process was kept up for several months till every point in bookkeeping was mastered, and still the story remained the same, three dollars and fifty cents per week. About the time a new suit of office clothes had been worn out Mr. Steptoe suggested that Thomas' salary be raised to five dollars per week. The move was made, and with the five dollars the young man was content for over a year. Matters ran on, and when he arrived at the age of manhood his name was down on the books as drawing eighteen dollars per week. One day a member of the firm made the remark to the young bookkeeper, "I think you need a rest." "Well," was the reply, "let me try my hand at selling on the road." "So far as I am concerned you can try it," was the answer. The members of the firm held a consultation, and only Mr. Steptoe was in favor of letting an inexperienced man go out. The heads of the firm had to that time done most of the traveling, and they did not see how a young man who had never even traveled for pleasure, and who they thought knew nothing of the country, could do any good on the road. Finally, to carry his point, Mr. Steptoe agreed to guarantee the firm any loss they might sustain by putting Mr. Egan forward. With this understanding the young man went to work on a new line. The fact that his expenses were guaranteed by an individual member of the firm encouraged him to get about and Bell. He worked harder than he otherwise would have done, visiting Chicago, Indianapolis and Lafayette. He sent his orders in, not knowing just what was expected of him, but confident that he was doing the best he could. When he came home he found that his Bales exceeded those of every other salesman, and, in fact, were the largest in the history of the firm. He was now sent out on the road, and stayed there seven years, his salary being raised to thirty-five dollars per week. In his twenty- eighth year, being tired of traveling, and though offered forty dollars per week to remain, he resigned, and determined to start in business for himself. He had saved $5,000, and with $1,500 of this he commenced housekeeping, having married Miss Alma E., a daughter of Rev. Dr. Frederick Haase, pastor of an Evangelical church at Chillicothe, Ohio. Mrs. Haase, nee Miss Theresa Von Bedenstadt, was a daughter of Gen. Von Bedenstadt, who was one of the German allies of England in the war with Spain during the reign of George III. With the $3,500 remaining he and two other men started to work, entering as equal partners, and renting one room of Steptoe, McFarland & Company, together with power. The room was 50 x 30, and the three partners did all the work. This was in the latter part of 1874, just when the country was recovering from the great financial panic, and, though it was hard work, the young firm kept their heads above water, and after running six months rented a warehouse across the street. Each man drew $20 per week, and it will be seen that Mr. Egan sacrificed nearly half his income for the pleasure of being his own boss. He declared, and does to this day, that no man can get rich on a salary, and he wanted to be rich. Though drawing but limited salaries the firm, known as the Egan Company, found that at the end of the year they had made the Dutchman's one per cent—that is, their profits were ten thousand five hundred dollars, or, in common parlance, one hundred per cent on the investment. This was so encouraging that Mr. Egan and his partners determined to branch out on a larger scale, and so in 1881 was incorporated the Egan Company, with a capital stock of §150,000. The incorporators were: Florence Marniet, Samuel C. Tatem, Frederick Danner, Edwin Kuthven and T. P. Egan. The last named was made president at once, and practically conducted the affairs of the company. Meantime, however, the one room occupied for a year and a half had been abandoned, and the firm removed to Front street, between Central avenue and John, where they rented an old mill 30x80, three stories high. As business progressed an addition to this was built. It was 40x80, four stories. On more business coming along a second addition, 40 x so, same height, was erected. Then came a destructive fire that leveled to the ground the old mill. This was rebuilt, and later a lot 180 x 100 was secured from Robert Mitchell and built upon. This gave the firm all the square on Front street between Central avenue and John, with the exception of thirty feet. The building now is reputed one of the best equipped and most expensive factories in the bottoms, and, in fact, in the United States. From employing themselves the three partners, all members now of the Egan Company and associated with the J. A. Fay Company, on the 1st of January last had on the pay roll four hundred men, and from a weekly stipend of $20 as his own master and thirty-five dollars as an employee, Mr. Egan now counts his weekly income by the thousands. From a small firm doing almost local business the Egan Company worked up a trade that is world-renowned. Contracts are being made constantly in South America, Europe and Africa, while some of the sales have been of great amounts. Across the street from the Egan Company was the J. A. Fay & Company, the rivals. From the first the Fay Company, established for years in a profitable business, tried to squeeze out the young but ambitious rival. Lawsuits sprang up almost from the start over certain patents to such an extent that the two firms' representatives were scarcely on speaking terms, and would not think of doing business with each other. Suits after suits had been brought, and each firm spent in the neighborhood of twenty thousand dollars trying to break each other up. The Egan Company took one case and carried it successfully through all the courts of Ohio, and finally won in the United States Supreme Court in 1889. This demonstrated to the firm that they were amply able to take care of themselves, and they became more and more aggressive. Mr. Egan was in the thick of the fight, and was determined that his firm should have a fair show at the world's trade if it took every dollar he was worth. He and others of the firm had 175 patents, but still the Fay Company held 200, and while the two firms separately controlled nearly all the wood-working patents in the country they were fighting each other. Finally in February, 1893, David Jones and H. B. Morehead laid their plans to capture both belligerents. They secured an option on the majority of the stock of both companies, and especially of the Fay Company, and then informed both managements that if a consolidation took place both businesses could be run on a more economical scale than formerly, and all litigation could be stopped. The arguments prevailed and articles of incorporation were taken out with a capital stock of two million five hundred thousand dollars. The officers of the Company are: Thomas P. Egan, president; Frederick Danner, first vice-president; A. N. Spencer, second vice-president; Edwin Ruthven, secretary; A. F. Herbaleb, assistant secretary; L. W. Anderson, treasurer; George W. Bugbee, master mechanic; S. P. Egan, general superintendent; L. G. Robinson, assistant superintendent, and George W. Passell, assistant superintendent. The directors are: W. H. Doane, W. P. Anderson, Joseph Rawson, David Jones and William A. Procter. 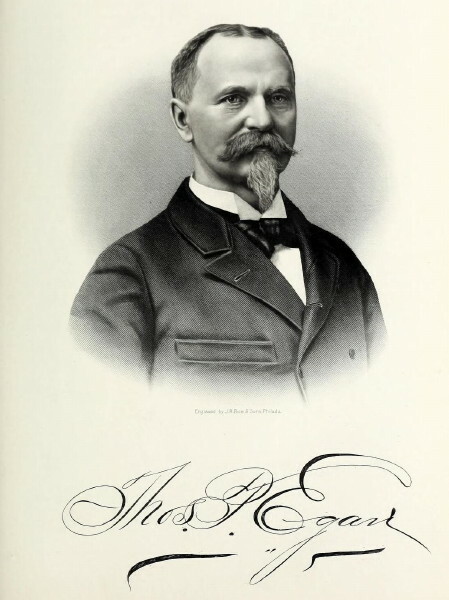 Mr. Egan controlled two-thirds of the stock of the old company, while most of his investments were in Fay stock, and when the management was organized he was chosen president of both concerns. Thus while the companies are under one management they work separately and distinctly, and make and sell their own brands. Recently at the World's Fair both made exhibits, and each took nine awards and one special grand medal, or, in all, eighteen awards and two special grand medals—more than any other firm in the world. The stock of the company is held by the best business men in the city, and with continued prosperity, that now seems assured, it will soon take considerable figuring to calculate Mr. Egan's wealth. It might be stated that the Mitchell annex, spoken of above, cost $40,000, and the tools to work with in it $235,000. One engine and boiler cost alone fifteen thousand dollars. Taking Mr. Egan from his business and looking at him as a private individual, he is extremely interesting. He is not a politician, neither a club man nor a society man, but he is one of the best examples of a home man that can be found in the city. Every evening he can be located at his pleasant home, No. 8 Wesley avenue. There he sips his sherry, smokes his one " Slim Jim," and chats with his family and friends. His amiable wife seems the counterpart of the husband, or, rather, each acts as a counterpart to the other. It is hard to say which has the better temper or the better nature. Both are running over with good humor, and both find the greatest pleasure in life in the enjoyment of each other's company. "Why does a man marry," asks Mr. Egan, "if he does not stay at home with his wife. I belong to no club, no political organization, no secret order. I do not patronize the barroom nor the hotel. If I should go out at night, where would I go?" It can be stated, however, that Mr. and Mrs. Egan are steady theater-goers, and they are also lovers of the fine arts, every display of note finding them in attendance. A Republican, Mr. Egan has twice thought he would join the Lincoln Club, but the pleasures of club life and the excitement of political strife have not yet been strong enough to lure him from his home. He is surrounded by a family of seven children, three of whom are boys, all anxious to get* to work. One daughter, Miss Alma E., is at Bartholomew's College; Fred is a student at the Ohio Military School, College Hill; Clifford, Christine and Edna are in the intermediate school, and Raymond and Virginia are still at home. Mr. Egan's business and family engross all his time, and the outside world scarcely knows him. Recently the tire commissionership was tendered him, but refused. Independent and manly, self-reliant and judicious, he goes his way and cares not for the side issues that usually engross the minds of men. Mr. Egan has never been out of the country since his first arrival, but in May he leaves for Antwerp, Belgium, where he acts as a representative of the United States at the local World's Fair. One incident is worthy of note, showing as it does the principal characteristic of the man. When John Steptoe, his old employer, was on his deathbed, he sent for an attorney, and also for Mr. Egan. Both sat in the sick room as the will was being made out, and Mr. Steptoe had determined that Mr. Egan should be executor. Mr. Egan, however, had determined that he would not be executor, for he did not want to be put under bond. He was debating in his mind what he should do to get out of the difficulty while the attorney was slowly drawing up the legal document. In the midst of his thoughts the attorney spoke up, "What bond shall I require?" The sick man raised his eyes to the attorney and said, sternly, "Thomas shall give no bond.'' This display of confidence so converted Mr. Egan that he at once decided to acquiesce and act as executor. He did, and, as the will recorded^ turned over to the aged widow every cent, and he was discharged by the court with a high compliment.